Amazon and Microsoft could provide cloud services for the HERE digital mapping service as well as taking minority stakes. BERLIN (Reuters) -- Amazon and Microsoft are in talks about taking a minority stake in HERE, a digital mapping business controlled by Germany's luxury carmakers to help develop self-driving cars, Daimler said. 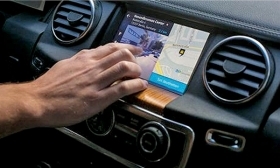 Germany's luxury carmakers including Daimler's Mercedes-Benz, Volkswagen's Audi division and BMW Group bought HERE for 2.5 billion euros ($2.8 billion) from Nokia last year to create an alternative digital mapping business to Google. "We are talking to Amazon, Microsoft and many automakers," Thomas Weber, a Daimler board member in charge of research and development, told the Wall Street Journal in an interview. A Daimler spokesman on Wednesday confirmed the remarks. "We need a cloud provider to handle the huge amounts of data created by HERE and its users. We haven't taken any decisions yet," Weber told the WSJ.